Whether you’re visiting L.A. or live here, there’s no denying the strong connection that Los Angeles has with the automobile. While we’re never short on our share of traffic (in fact, we often seem to lead the nation in traffic troubles), the city and its cars have had a wild ongoing love affair for many decades. Like all good couples, they have their spats, but they always seem to get back together, never staying separated for long. Wes and I had the pleasure of exploring a recent exhibit at the Getty Museum titled “Overdrive: L.A. Constructs the Future, 1940-1990.” This endeavor was “the first major exhibition to survey Los Angeles’s complex urban landscape and diverse architectural innovations.” What drew us to this exhibit? An entire segment devoted to car culture and how it impacted L.A.’s development! 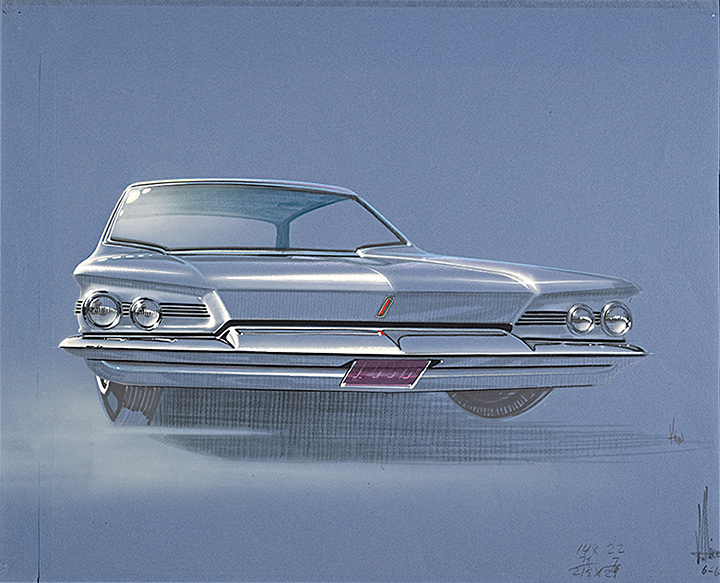 Photo: Ford Styling Concept, 1960s, John P. Aiken. Pencil, colored pencil, marker, chalk, and gouache drawing on paper, 19 5/8 x 24 1/2 in. (49.8 x 62.3 cm). The Getty Research Institute. This exhibit was (as is to be expected from the Getty) expertly curated and filled with fascinating details about L.A.’s changing landscape in response to the automobile. “Los Angeles’s identity is inextricably linked with the automobile. During the mid-20th century, cars were strategically transformed from convenient modes of personal transportation into rapidly produced, gleaming symbols of self-expression.” Self-expression, indeed! Any car fanatic can easily identify the decades where automobile styling began to seriously focus on form just as much as function. 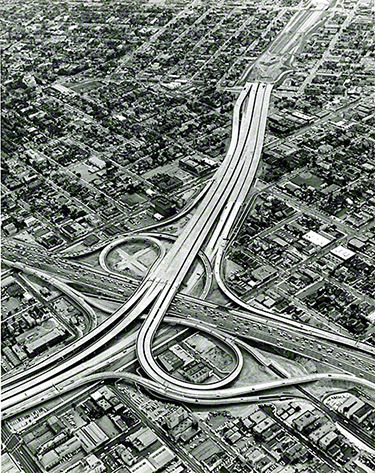 Photo: Santa Monica Freeway (Interstate 10) and Harbor Freeway (Interstate 110) Interchange, downtown Los Angeles, construction completed 1959. Photograph by Dave Packwood, 1962, 10 x 8 1/8 in. (25.4 x 20.6 cm). Automobile Club of Southern California Archives, via The Getty Research Institute. Photo: Romeo’s Times Square by Armet & Davis, Mid-Wilshire, construction completed 1955. Pencil drawing on paper, 1955, 22 x 63 in. (55.9 x 160 cm). Collection of Armet Davis Newlove Architects, via The Getty Research Institute. We loved learning how L.A.’s architecture was, in large part, driven by the intense car culture that had rapidly grown within the city. The more we look at vintage structures (like the Googie-inspired Times Square above), the more we see the lines of our favorite vintage autos echoed in its architecture. The next time we drive around L.A., we’ll be looking at these architectural gems with a new appreciation for their design!